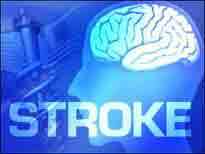 A stroke or "brain attack" is a very serious condition which kills over 80 percent of and leaves two thirds of survivors with some degree of disability from minor problems such as a weakness in one of their members to complete paralysis of one side of the body and loss of speech. The brain attack may happen because an artery or blood vessel becomes blocked by a blood clot, preventing oxygen being carried to part of the brain. When this happens the brain cells in this area of the brain die and brain damage occurs. This is known as an Ischemic stroke. A brain attack can also be caused when a blood vessel in the brain breaks and bleeds into the brain. This is called a hemorrhagic stroke and accounts for 20 percent of all brain attacks. This causes cells to die, as they are no longer receiving nutrients and, above all, oxygen. Hemorrhagic attack is less common than Ischemic type but is more often fatal. When bleeding occurs in the space that lies between the brain and the skull this is referred to as a subarachnoid hemorrhage or haemorrhage (British Spelling) and is often caused by a burst aneurysm (like a hernia in the blood vessels in the brain). 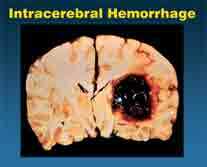 Bleeding within the brain tissue is called an intracerebral hemorrhage and is often caused by hypertension. The ability to control areas of the body that are activated by that area of the brain is lost when brain cells die due to an attack. These abilities include speech, movement and memory. The effect of the damage depends on where the attack occurs in the brain and how much of the brain is damaged. Therefore, someone who experiences a small brain attack may escape with only minor problems whereas someone who has a major attack may find themselves confined to a wheelchair and unable to speak. There are several warning signs that may mean you are having an attack. If you experience any of these you need to consult your doctor or emergency services immediately. Numbness or weakness of face, arm or leg - especially on one side of the body. Problems with your vision that prevent you seeing in one or both eyes. Dizziness or problems with balance or coordination. These symptoms usually come on suddenly with no warning. Emergency assistance is imperative, so call an ambulance, especially if you live alone. There are several risk factors which we do not have any control over, including age, gender, race and heredity factors, as well as some other health conditions which can increase your risk of having a brain attack. However, there remains much that can be done to dramatically reduce your risk. The major things we can do are outlined below. However, if you think you might be at risk it is advisable to seek medical advice. Get advice from your doctor on lowering your risk.Know the symptoms (above) and if you experience any, get help right away. 1. Lower your blood pressure. Speed is of the upmost importance when treating a stroke ,which is why there are various campaigns to make people aware of the symptoms. A fast response for treating the brain attack has been known to almost reverse the effects. But for this to happen, the treatment has to be given within a few hours after the symptoms appear. Upon admission to hospital the patient will be given a CAT scan and treatment will depend on the type of attack and the length of time when it occurred. The long-standing outcome depends on the severity and how much impairment was caused to the brain. The patient will have to work hard with a physiotherapist as well as a speech therapist to recover the abilities lost and to regain the possibility of participating in all the activities that were accomplished prior to when the attack happened. Long-term rehabilitation can take months or even years and measures should be taken to prevent depression and to keep a positive outlook.